← Marian Nichols. House of Riddles. New York: Xlibris, 2007. Rose Senehi. Render unto the Valley. Chimney Rock, NC: K.I.M. Publishing, 2012. Karen Godwell is a curator at one of the most prestigious institutions in the United States: the Metropolitan Museum of Art in New York City. She has carefully hidden the North Carolina-born mountain girl she used to be behind a veneer of New York sophistication, but when her husband Joel dies, everything changes. Joel, with his writer’s soul, fell in love with North Carolina as much as Karen tried to forget it, and he always urged her to return. When Karen gets wind that something has gone badly wrong with her family there soon after Joel’s death, it’s the impetus she needs to fulfill his wish. She and her young daughter Hali pack their things and move south, where Karen takes a job at the Folk Art Center just outside of Asheville. But it was a famous Ashevillean who knew that you can’t go home again so easily, and trouble waits for Karen in spades. Karen fled the Old North State for a reason: her sociopathic brother. Abused and neglected by their alcoholic mother’s string of shady boyfriends, Karen and her siblings Travis and Amy had a hard life that improved only when mom left for good, leaving the children to be raised by her parents. Grandma Pearl and her farm saved Karen, but there was never any hope for Travis. Outwardly handsome and charming, Travis takes delight in seemingly random acts of cruelty and violation. Finally he has gone too far, placing Grandma Pearl in a rest home and taking her ancestral farm for himself by force. Obsessed with becoming wealthy, only his sisters stand in the way of his selling everything that their family has held dear for generations. In order to save her family’s, and daughter’s, future, Karen must finally face her childhood, with all its traumatic secrets. 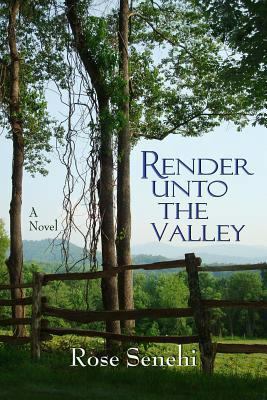 The third of Senehi’s stand-alone novels set in the Blue Ridge Mountains, Render Unto the Valley is an absorbing tale of homecoming, family, and the courage it takes to face the past. Art, environmental protection, and the preservation of personal and local history are all themes that make this an enriching and entertaining read.